The buzz around Space to Create Paonia is picking up again. Along with the excitement comes many questions from the community. What is Space to Create? Isn’t it already a done deal? Is Space to Create a way for just a few people to make a bunch of money? What about people who have need for low income housing who aren’t creatives? What does Space to Create mean to me if I am not a creative? The truth about Space to Create Paonia (S2C) is that what it will be is still unknown. Paonia applied to be one of the communities to benefit from Space to Create and has been diligently working through the pre-approval steps. It is still in the pre-development phase, a multi-step, multi-year process to assess the unique needs of the local community. The parameters given by the state are that S2C will be affordable workforce housing and working spaces for creative sector entrepreneurs and artists in rural, small town and mountain communities in Colorado. That is the outline. It is up to the entire community to help fill in the details. To facilitate this process, Space to Create Paonia and Artspace, an affiliate of Space to Create, crafted a thorough online survey called the Arts Market Survey. This survey collects information on the needs of the arts sector as well as non-creative sector needs – it is available online for anyone and everyone to give input. The goal is to receive 400 surveys from creatives and non-creatives, those for, against and undecided on S2C, people living in Delta County and beyond, and anyone else who wants to participate. Survey participants will be guided to share what they think the community needs, which could include affordable education space, gallery space, store front, community gathering space, performance space, etc. The Space to Create Paonia executive team consist of Paonia Town Trustees: Mary Bachran and Karen Budinger, Town of Paonia Administrator Ken Knight, volunteer Elaine Brett, NFVCC volunteer Board President Susie Kaldis, and Sharon Bailey, a part time contractor for the NFVCC (position funded by an Anschutz Family Foundation grant). 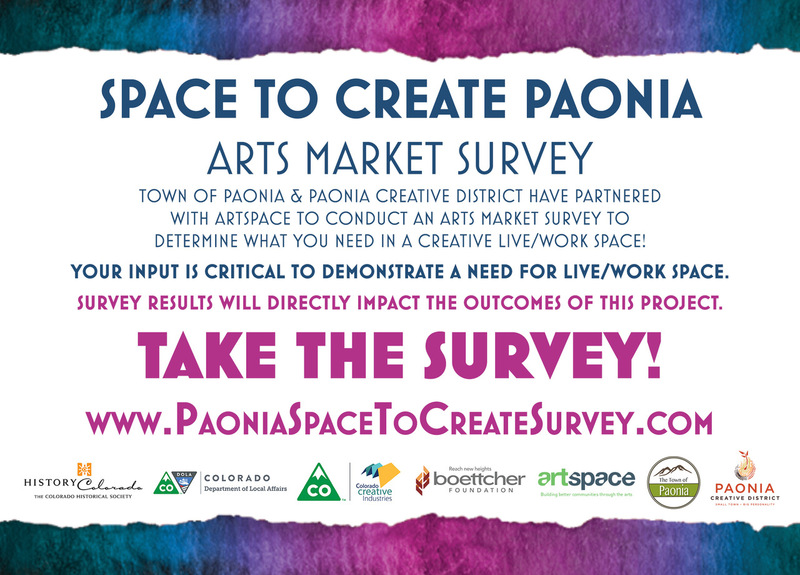 At this time, Space to Create Paonia is primarily being funded by awards from the Boettcher Foundation and the Department of Local Affairs with a small commitment from the Town of Paonia and NFVCC. One purpose of this project is to diversify and build economic development, primarily, but not entirely, in the creative sector. The S2C team is working with the partners and the state to find ways to include as many populations as possible into the project. Those citizens who wish to see more done for the various populations in need are encouraged to take the Arts Market Survey online and include their input. Take the online Arts Market Survey at: www.PaoniaSpaceToCreateSurvey.com. For questions, please contact Ken Knight at kendknight@townofpaonia.com or Sharon Bailey at sharons2c@townofpaonia.com.